Jersey's Team Jets have moved top of Premier League Three with a comfortable 60-45 win over bottom club Loughborough TFC at Les Ormes. Jets were never behind in the game as they clinched a third consecutive victory in their first ever season at national level. Their stay at the top may only be for a matter of hours, with the rest of the leading sides due in action on Sunday. "I'm happy with that result," coach Linda Andrews told BBC Radio Jersey. "The next two [Kent County and Ryland] are playing each other tomorrow and I'm thinking to myself 'do we want a draw and what's the best outcome for us' but it's lovely to be at the top. "I think we're doing really well at the moment so we'll just keep going one game at a time." Team Jets led 17-11 by the end of the first quarter and never looked back, holding a 29-23 advantage by half-time. 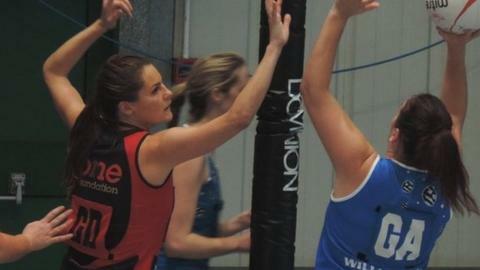 The Jersey-based outfit were after clinching the South West Regional Division One title. Loughborough TFC remain at the foot of the table and are still in search of their first win of the campaign.